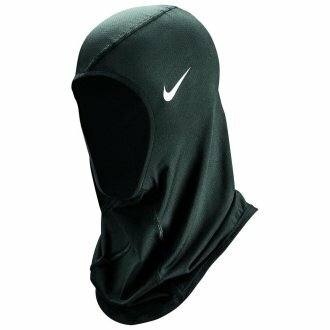 A revolutionary wear, the Nike Pro Hijab has been developed to provide the ultimate wear, in a combination of athlete intuition and Nike's superior performance knowledge. Providing full coverage of the head and neck, this pull-on design brings a personalised fit, ready to adapt to both the wearer's head shape and her sport. In a lightwei..
A revolutionary wear, the Nike Pro Hijab has been developed to provide the ultimate wear, in a combination of athlete intuition and Nike's superior performance knowledge. Providing full coverage of the head and neck, this pull-on design brings a personalised fit, ready to adapt to both the wearer's head shape and her sport. In a lightweight yet durable, single-layer Nike Pro power mesh with incorporated Dri-Fit technology, the Pro Hijab brings the ultimate breathability. With an elongated back, the user can feel safe in the fact that this garment will not come untucked, whilst further comfort is presented in the fluff threads to the neck, eliminating irritation and rubbing when sweat sits on the skin. The iconic Nike Swoosh proudly sits on this garment, finishing a truly remarkable wear.